I've been wanting to try the coffee that they roast on-site each Saturday morning at the All Local Farmer's Market at 711 Whaley in downtown Columbia, SC. I finally remembered to bring enough cash to grab a bag of Indah Coffee Co.'s whole beans on my way out yesterday! Anyway. THIS COFFEE IS FLIPPIN' AMAZING. Roasty, toasty, nutty, s'mores-y with the teensiest, weensiest ting! of anise. It's my new jam. (Indah doesn't sell brewed coffee at the market, though. The Gervais and Vine guys take care of that, along with their AMAZING $5 plates of brunch treats like smoked gouda & arugula strata, and gorgonzola hash browns. 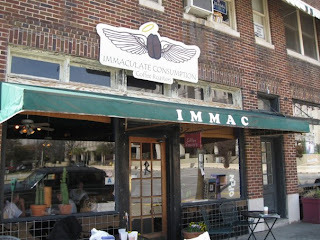 Prior to this morning, I've been loving on Immaculate Consumption's locally roasted, fair trade coffee for a while. I have recently fallen in love again with the Immac in general, since my business partner Debi and I have been scheduling a lot of client and intern meetings there due to its indie vibe, warm feel, spacious tables, and fabu location right by the SC State house. Oh -- and it's probably time to mention this fabulous new development: Debi Schadel and I are now partners in an events and PR/marketing/social media firm! Anyhoo, back to coffee tawk. 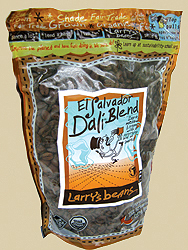 I also have been having a long-term relationship with the organic, fair trade "EL Salvador Dali" variety of Larry's Beans (from North Carolina). I don't know if Indah's coffee is fair trade or organic, and their website doesn't say. I'll find out next time I see them at the market! I can tell you that another local roaster of delicious coffee, Iron Brew Coffee out of Blythewood, SC, *does* go the fair trade route. In fact, they import directly from farmers they know in the Cerrado region of Brazil's central highlands. Iron Brew is a really nice family-owned business, and the coffee is great. I know they sell it at Earth Fare; I met the son, Matt, one day recently when he was doing a demo there. Matt informed me that light roast coffee has more caffeine than dark roast. Did you know that? I didn't know that! Crazy! But really good to know. I have been feeling rather peppy in the mornings after having a couple of cups of the Iron Brew Breakfast Roast, a light roast coffee. Ha! 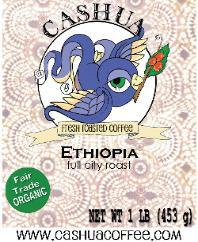 There's another fabu locally roasted coffee that cannot go without mention: organic, free trade Cashua Coffee! The Shop Tart loves her some Cashua Coffee, and they will bring beans to your house if you ask real nice. How cool is that? I like Cashua, but I have trouble finding anything but a dark roast from that line. I am a medium roast kinda lady. [UPDATE! (March 20, 2011) Turns out I LOVE Cashua Coffee! I got confused and thought that "Full City Roast" (all of their coffees except French Roast) meant dark roast. Speaking of medium roast, that's what my new favorite coffee is. 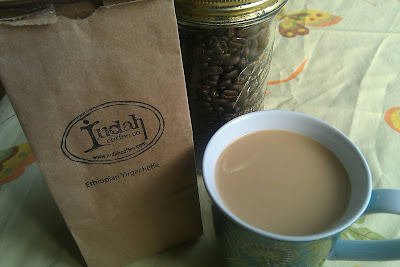 Indah Coffee Co's Ethiopian Yirgacheffe. I'm going to go and make another cup. Right now. So busy! Oh my goodness! You always seem to handle it gracefully though. Love your coffee post. One of the things that I still am grateful for having worked at Starbucks is the wealth of coffee knowledge I gained. At least back in the day, the company was big on that. Most "breakfast blends" are so called not only cause they have a milder flavor, but the lighter roast gives them more umph... which is appreciated in the A.M. The caffeine is essentially roasted out of the darker roasts (not that they're caffeine-free). Also, I'm so excited about the event planning you're doing at City Roots! I just got back from breakfast at the Gourmet Shop-- they're brewing Illy of course and it is oh so cup worthy. So naturally my husband and I got on the topic of good coffees and were saying that we need to seek out some local roasters. Leave it to you to give us the local info! Indah is on my list for next Saturday morning at the All Local and I'm also happy to learn about Iron Brew at E.F. and Cashua Coffee. Thanks Tracie! Thanks, Jana! That makes sense about the breakfast blends, now that you note it. Ha! And thanks, Kim! That is so cool! 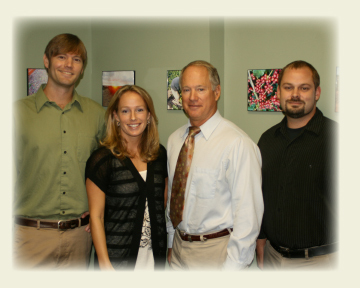 Thanks for the great post on locally roasted coffees! Great info. I've been loving the Cashua, too, and now I'm hot to try some Indah! Keep up the good work. Cashua Coffee has plenty of Full City (medium roast) roasted coffees! Check us out www.cashuacoffee.com and yes, we will bring your coffee to your house! !